Fredericksburg is THE Place to be! Fredericksburg's Main Street program reflects on first year's progress Officials from the Fredericksburg Main Street Initiative met Thursday with downtown business leaders to share what was successful during its first year of promoting local businesses—and what wasn’t. Main Street hired director Ann Glave in February and among her first public initiatives included stores staying open late on Fridays leading up to the holiday season, promoting Small Business Saturday, urging the use of social media and a downtown gift card program. Small Business Saturday was the group’s biggest hit of 2014, Glave said. The event, designed to attract shoppers downtown and help independent businesses compete with major chain stores’ Black Friday deals, was celebrated with early store openings, red carpets outside of storefronts and coffee for early shoppers. Glave said shoppers reported going into some stores for the first time and stores reported 30 to 300 percent increases in sales compared to the same day the previous year. Fred Wellman, who owns Ladyburg in downtown Fredericksburg with wife Crystal Wellman, said his store doubled its sales that day. “It was huge for us,” he said. “It shows what we can do if we all pull together There’s real untapped potential to create a commerce center.” Rich Newpher of Commonwealth Lighting also shared that his business saw increased sales on Small Business Saturday. “It’s a big thing for Fredericksburg,” he said. “We’ve been here for a long time and are focusing on our showroom more.” The business also won Main Street’s “Window Wonderland” contest for the best store window. Commonwealth Lighting chose to donate its winnings back into the Main Street fund. 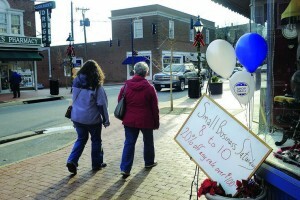 Glave found the stores that did the best in Small Business Saturday were not typically discount-driven. Those who offered small discounts that were atypical for their businesses, as well as those that opened earlier, fared best. Dog Krazy, she said, did as much business as it would on a typical Saturday in its first two hours that day.